Box Text: BLEACH prorompe nel tuo mondo! Inizia la battaglia contro gli Arrancar! Controlla il destino dei tuoi personaggi preferiti! This is a list of VGCollect users who have Bleach: Soul Resurrección [IT] in their Collection. This is a list of VGCollect users who have Bleach: Soul Resurrección [IT] in their Sell List. 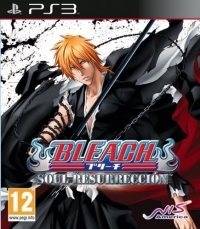 This is a list of VGCollect users who have Bleach: Soul Resurrección [IT] in their Wish List.